Experience PRS 2012 Swamp Ash Studio Multi-Foil, Other Shape Guitar from PRS in the Special Edition Guitars series. Forty Swamp Ash Studio Multi-Foil guitars were made for Experience PRS 2012. The Swamp Ash Studio is an updated take on a single-single-hum guitar with PRS’s Narrowfield pickups in the middle and bass positions and a 57/08 humbucker treble pickup. This pickup configuration is paired with a 5-way blade switch. The swamp ash body is designed to provide "clear bell-like highs, pronounced mids, and strong lows," and the bolt-on neck is sealed. This run of instruments is comprised of five multi-foil colors: Aqua-Foil, Desert-Foil, Franken-Foil, Happy-Foil, and Solar-Foil. PRS Experience 2012 Amplifiers To complement the traditional Experience PRS Limited Edition guitars, PRS has spec’d a grouping of Experience 2012 amplifiers. EHX Pan, Volume & Expression Pedals EHX introduces three new pedals with no moving parts that feature the same rocking chassis. 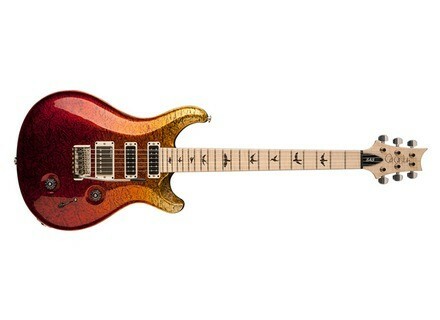 PRS Experience 2012 P22 & Custom 24 PRS introduces 2 new Experience 2012 guitar models: the Custom 24 and the P22.